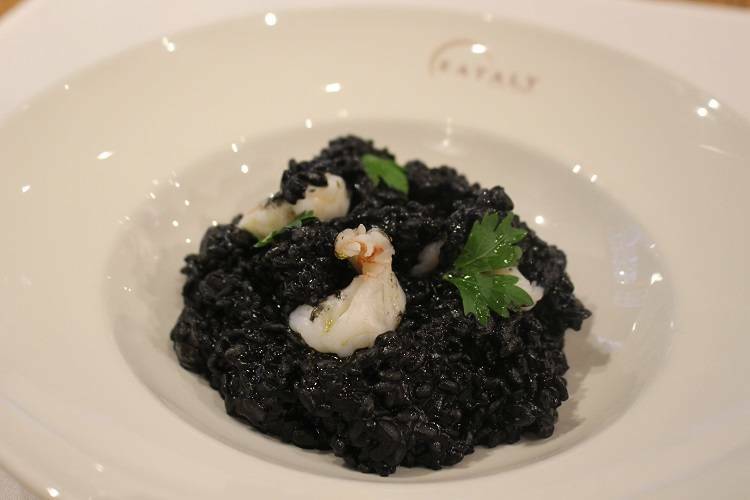 Typical to Venezia, this flavorful recipe for black risotto with squid ink and shrimp incorporates ingredients that are readily available from the lagoon. Enjoy this traditional dish with a glass of white wine, and you will be transported to the canals of the "Floating City"! Peel the shrimp and reserve shells. With a small knife, make a shallow cut down the back of the shrimp to remove the dark vein. Cut the shrimp crosswise into thirds. Heat the oven to 300ºF. Toast shrimp shells for 20 minutes. Heat olive oil in a medium stock pot. Add carrots, celery and onion and cook without moving until caramelized. Move vegetables to side of the pot, add a little bit of olive oil to the bare spot and add tomato paste. Sauté until it turns from bright red to maroon. Mix paste in with vegetables, add toasted shrimp shells and water. Simmer for 1 hour, then strain. Heat 3 tablespoons of the olive oil in a heavy casserole or pot and sauté the shallots, adding salt and pepper, until clear, stirring often, about 8 minutes. Add the rice and stir to coat with the oil. Toast the rice until the edges become translucent, 1-2 minutes. Pour in the red wine and crush 2 of the ink sacs. Reduce the heat to a simmer. Stir until the liquid is incorporated into the rice mixture. Continue cooking the rice, stirring constantly and adding ladleful of the broth as needed until just before the rice is cooked al dente, about 25 minutes. Add the chopped shrimp to the rice just before the last cup of stock is added. Mix well and cook, adding the last cup of stock until the rice is creamy and al dente, 3-4 minutes longer. Remove the pot from the heat and stir in the chopped parsley and two tablespoons of high quality olive oil. Adjust the seasoning, if necessary, with salt and pepper. Serve immediately, ladled into warm shallow bowls, and pair with a crisp white wine from the Veneto.